What An Advertising Challenge Illustrates About The Mind : 13.7: Cosmos And Culture Commentator Tania Lombrozo uses Apple's new Retina 5K display offering to illustrate a deep point about the limits of human learning. 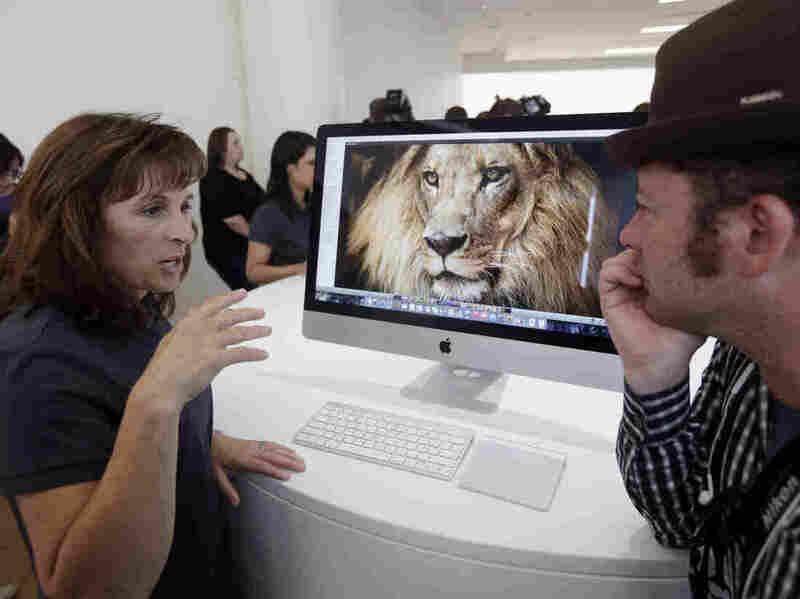 An Apple employee explains the features of the new iMac, including its Retina 5K display. If you followed tech news last month, you heard a lot about Apple's new iMac with Retina 5K display. And if you came across advertisements on television or online, you undoubtedly saw the display in action. The trouble is, you can never really appreciate 5120 x 2880 pixel resolution on, say, a 3840 x 2160 pixel display. You can't represent something in higher resolution than your own resolution permits. This advertising challenge for Apple illustrates a pretty profound point about human learning and development, one that goes back to the foundations of cognitive science and an influential debate between two prominent thinkers: Jean Piaget and Noam Chomsky. Piaget endorsed a stage theory of development, according to which the child acquires progressively more abstract and sophisticated ways of reasoning. In particular, Piaget argued that through interactions with the world, children's representational capabilities become more powerful over time. Thus an adult, according to Piaget, could represent thoughts that a young child could not. Noam Chomsky, in contrast, advocated a view according to which cognitive characteristics — most notably language — emerge from biological maturation and the expression of complex representational structures that were present at the outset, not learned through experience. For Chomsky, an adult's representational potential is effectively contained within the child. These very different thinkers came together once and only once, at a famous debate in France in 1975. Intellectual sparks flew, and many of the issues in the field are still defined by the terms of that exchange. One of the most influential arguments to emerge from the debate came from Jerry Fodor, a philosopher who challenged Piaget's views about learning and advocated a more Chomskyan alternative. Fodor argued that a system can never learn or "construct" richer representational capabilities. A system that reasons with first-order logic, for example, can't reason its way to second-order logic: First-order logic doesn't contain the tools to represent statements in second-order logic in order to even entertain them as hypotheses about how to represent the world. Just like Apple's advertising challenge: If you're a display with 3840 x 2160 pixel resolution, you lack the basic machinery to represent images at 5120 x 2880 pixel resolution. These considerations led Fodor to posit a rich and complex innate endowment, with little role for learning. "There literally isn't such a thing," he's quoted as having said, "as learning a conceptual system richer than the one that one already has." The implication? It's either an illusion that the adult has greater representational power than the child, or any change is due to biological processes such as maturation, not to learning. Not everyone agrees with Fodor's radical conclusions, but his challenge to more Piagetian approaches has shaped the field. So next time you see an advertisement for a high-resolution computer display on your old laptop, you won't learn what that display really looks like. But if it makes you think back to a meeting of minds at the heart of cognitive science, you'll have learned something new about learning, and about the challenge of explaining whether and how we ever go beyond simply acquiring new information — new images at our current mental "resolution" — to more powerful representational structures — images with truly greater "resolution."